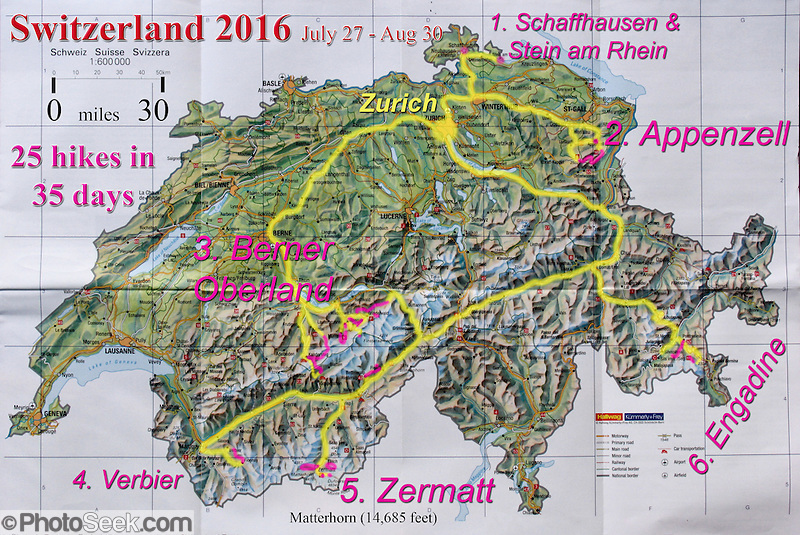 Travel tips and photographs for Switzerland. Switzerland: Berner Oberland & neighboring Loetschental. 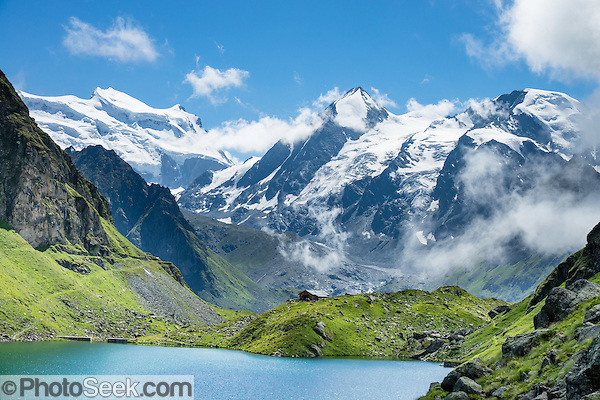 Mont Blanc and the High Route: trek the Haute Route from Chamonix’s Mont Blanc (France) to Zermatt’s Matterhorn, via Switzerland’s Valais canton; or loop the Mont Blanc Circuit, or day hike from Chamonix and Courmayeur (Italy). Switzerland: more in Valais/Wallis canton: Fiesch (Eggishorn); Verbier (Lake Louvie). Switzerland: Engadine Valley: trek 5+ days admiring distinctive architecture & icy peaks. Switzerland: Appenzell: trek 1-5 days via a splendid microcosm of Swiss mountain traditions. Switzerland: Schaffhausen canton: 1-2 days old town, Rhine Falls & historic Stein am Rhein. Dolomites and Venice, ITALY article. Click here to view my Portfolio of Alps favorite images from hiking in Switzerland, France, Italy, and Slovenia. In the above video captured at unforgettable Eigeralp farm in Bussalp above Grindelwald, the cheesemaker gave an impromptu accordion concert, inspiring some to dance. In your home country before departure, buy a Swiss Pass for free travel on most Swiss rail lines and Post Buses (discounted for 2+ people traveling together, or age 60+, or under age 26) and discounts on most lifts. Various Flexi Pass options save money for public transportation on days of your choice everywhere in Switzerland. For one-way hikes within Switzerland: Post your luggage ahead to train and Post stations, or have hotels send your bags ahead. Renting a car can beat train prices for 3 or more people traveling together (though parking can be a problem in big cities). Money: Switzerland costs are similar to resort areas of the USA. From 2005-2016, exchanging the US dollar for Swiss Francs has been better than for the Euro (used in France, Italy, and Austria). Restaurants are expensive. Spend less on food by packing a thermos bottle to fill at your hotel in the morning for hot drinks during the day, along with a sack lunch assembled from Coop or Migros grocery stores. Finding a flat with kitchen was our favorite deal in the Dolomites. Use hiking poles (as do Europeans) to assist ascents, protect your joints on descents and improve hiking stamina by 20%. Time change: set your watch +9 hours from Pacific Standard Time (PST=west coast USA) to get Central European time (CEST is GMT+1). Allow a full day to recover from travel weariness and severe jet lag, plus 2 or 3 days to recover your sleep schedule. Guidebooks: Buy a travel guidebook plus hiking guidebook at bottom of this article for planning and reference along the way. July 1 through August 15 is high tourist season, after which local kids go back to school and parents don’t have as much time to visit the tourist areas, which are then less crowded. Our trip July 27-August 30, 2016 had almost perfect weather, vast variety of wildflowers, and little problem with crowds (lots of lodging options). July to early August has the best wild flower displays. We were still impressed by flowers in September 2005. Late August through September is a great time to go for good weather and also avoiding crowds. Yellow larch and other impressive fall colors begin in middle to late September. Many mountain huts start closing in early September. Stay in valley hotels all year. Hiking season continues through October in the Dolomites, Italy, which are consistently clearer, warmer and drier than the Alps of Switzerland, France & Austria, which are further north. Swiss hiking season ends about late September or early October due to snow in the mountains and the closure of many visitor facilities. When winter snowpack builds up a few months later, the Alps throng with skiers, creating bigger winter crowds than summer in ski areas such as Zermatt, where building booms have provided lots of lodging. A north wind generally means good weather in the Alps. Check weather forecasts and start hiking early in the morning. In many mountain areas, sun heating the ground in the morning can often build up clouds and thunderstorms in the afternoon. Patient photographers can look for attractive cloud breaks in the hours around sunset. The Valais, Zermatt, and Matterhorn tend to be sunny and dry with the highest hikes in the country. Bernese Oberland and the Eiger are much rainier than the Valais and Engadine. The astounding beauty of ice clad peaks soaring high above verdant green pastures sprinkled with wildflowers must be seen to be believed. France: Chamonix climate is somewhere between Geneva and Zermatt, one of the drier alps areas in the rain shadow of Mont Blanc. September to early October is best hiking weather. Tre Cime di Lavaredo (in Italian), Drei Zinnen (in German), or “Three Pinnacles” (in English) circuit with refugios. The vast majority of glaciers in European mountains are in retreat, which seriously affects water management downstream. Alps glaciers have lost about two-thirds of their volume since the 1850s, and glacial retreat has accelerated since the 1980s. See for yourself the affects of global warming in Switzerland, such as by hiking to Morteratsch Glacier. Read more about global warming/climate change. The Berner Oberland (Bernese Highlands, Bernese Oberland, or Bernese Alps) is the southern and higher elevation part of Bern canton in Switzerland. How to get there: From Zurich downtown train station, ride 4 hours to Interlaken, where you board a train to scenic Grindelwald Valley or spectacular Lauterbrunnen Valley. UNESCO lists Jungfrau-Aletsch-Bietschhorn as a World Heritage Area featuring the most glaciated part of the Alps, Europe’s largest glacier, and a range of classic glacial features such as U-shaped valleys, cirques, horn peaks, and moraines. The ongoing uplift and compression that formed the High Alps has left an outstanding geological record. A diversity of flora and wildlife thrives in a range of Alpine and sub-Alpine habitats. In the wake of retreating glaciers, witness the colonization and succession of flowers and plants. The impressive vista of the North Wall of the High Alps, centered on the Eiger, Mönch and Jungfrau peaks, has played an important role in European art and literature. is the wonderful site of my best-selling image: Eiger, Mönch, and Jungfrau 81ALP-04-15. Männlichen Royal Walk: Männlichen mountain (2343 meters elevation or 7687 feet) gives a stunning view of the peaks of Eiger (Ogre 13,026 feet), Mönch (Monk), and Jungfrau (Virgin 13,600 feet) with a foreground ridge enhancing the sense of scale. Männlichen can be reached from Wengen by the Luftseilbahn Wengen-Männlichen (LWM) cable car, or from Grindelwald using the Gondelbahn Grindelwald-Männlichen (GM) gondola. Then walk 15 minutes on a paved path to the summit. Go before 1:30PM to avoid frequent afternoon cloud buildup. Return down the hill, then traverse 2 leisurely hours to Kleine Scheidegg train station, facing stunning mountain views at every turn! A special cog train runs from Lauterbrunnen to Wengen to Kleine Scheidegg to Grindelwald and back. Wander around Lauterbrunnen for amazing views, including 1000-foot-high Staubbach Falls, in one of the world’s most spectacular glaciated valleys. Hike from Mürren (or Gimmelwald) up towards Birg and the Schilthorn as we did, and take the cable car back down for a very scenic day (or lift up and walk down). Or walk Mürren to Griesalp one way 10 miles, 3000-4000 feet gain, then take the Kiental bus out. Optionally stay overnight in Griesalp and continue walking from Griesalp to Kandersteg. On a rainy day, visit “Trummelbach Falls inside the mountain,” an underground slot canyon (entry fee). We loved hiking to the quiet retreat of Berghotel Obersteinberg, which offers tremendous views of waterfalls and peaks in Upper Lauterbrunnen Valley, spotlit at sunset. Lit by candle light at night, this romantic escape built in the 1880s recalls an earlier era without power. The main luxuries here are flush toilets down the hall, and traditional Swiss hot meals. The private double rooms lack electricity, and bowls of water serve as bath and sink. Obersteinberg is a 2-hour walk from Stechelberg, or 4 hours from Mürren. From Obersteinberg, don’t miss the 2-3 hours round trip to the deep-blue tarn of Oberhornsee in the upper glacial basin, beneath snowcapped Grosshorn, Breithorn and Tschingelhorn. Faulhorn Trail from Schynige Platte to First is one of the finest hikes in Switzerland. Walk 6.5 hours, 9 miles, ~2700 feet elevation gain. (Optionally reverse direction for less uphill, 2300 feet total, arriving at Schynige Platte by 17:00 or 18:00 to catch the last train.) A sunny uncloudy day is required to see vast mountain views. 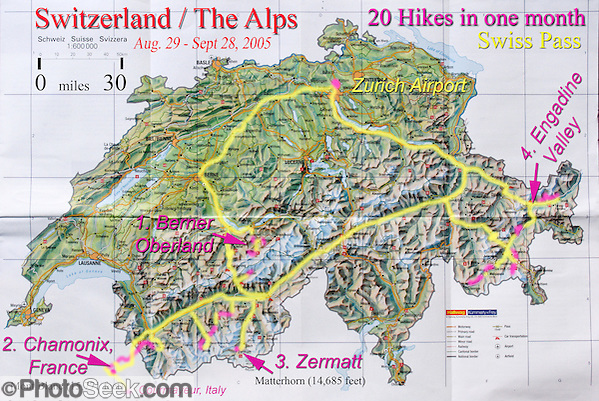 See hike #39 in “100 Hikes in the Alps” by The Mountaineers. Directions: Stage the hike from lodging in Grindelwald. Take Wilderswil cog rail 1 hour to trailhead at Schynige Platte (2068m). Hike by fantastic rock shapes in a deep valley. Walk on the east side of Bachalpsee. Ascend 15 minutes side trip to Faulhorn. Optionally overnight on top in atmospheric Berghotel Faulhorn for stunning sunset and sunrise views. Photographers should plan to reach spectacular First at the end the hike in the afternoon, because sun striking early morning haze obscures mountain details. At First (2168 meters elevation), lift down to Grindelwald, or from Mittelläger take the ~hourly Post bus. Better yet, start at Eigeralp farm (optionally overnight, eigeralp.ch) in Bussalp (above Grindelwald) with a fresh farm breakfast, watch alpine cheese-making, then hike a shorter route to First gondola. Hike a very spectacular trail from Eigeralp farm in upper Bussalp, around Faulhorn to Bachalpsee, finishing at the gondola lift station at First, which descends to Grindelwald BGF. Every day, Eigeralp farm produces a variety of artisan cheeses and Alpine butter from raw milk in a large cauldron over an open fire. For breakfast, enjoy fresh bread from the oven, Alpine butter, various cheeses, yogurt, homemade jams, coffee, tea and fresh milk! While Eigeralp’s huts were built in 1892, its traditional cheese hut dates from the 1600s. While breakfasting, gaze over the peaks of Eiger, Mönch and Jungfrau in astoundingly spectacular high meadows. Getting there: ride the private GrindelwaldBus.ch to the last stop in Bussalp, then ascend 40 minutes on foot. Hike comfortably along a steep hillside from Pfingstegg gondola to eat tasty desserts at scenic Berghaus Bäregg (5 miles round trip, 1500 ft) across from the eastern foot of the Eiger, high above the White Lütschine river. Walk boardwalks and tunnels through the dramatic Gletscherschlucht of Grindelwald, a deep gorge of the White Lütschine river, flowing from Lower Grindelwald Glacier. From Gletscherschlucht Hotel-Restaurant, a wooden walkway leads over raging water, through galleries and rocky tunnels over 1000 meters into the ravine, under 100-meter high cliffs. To test your fear of heights, totter across a blue net over the foaming torrent. Walk there in 35 minutes from the center of Grindelwald (recommended via the LandArt-Grindelwald.ch exhibit along the river), or take the bus. Hike from First gondola lift station above Grindelwald, across Grosse Sheidegg pass, then walk down the quiet, protected pastures of Rosenlaui valley beneath soaring peaks, to Rosenlaui PostBus station for a ride down to Meiringen. Meringue, the dessert made from whipped egg whites, was invented in Meiringen. Along the way, explore a narrow walkway carved through Rosenlaui Glacier Gorge / Gletscherschlucht. In this deep ravine, the Weissenbach River has eroded potholes into a natural cathedral of slate and limestone. Nearby, Grimselpass / Grimsel Pass has interesting bare granite geology colored by lichen, but the extensive system of hydro-electric dams built in the 1920s and 1950s dominates the scenery and the aging hotels didn’t look attractive. We considered but didn’t do the Sidelhorn hike: Starting at Postbus stop at Historic Alpine Hotel Grimsel Hospiz, take Sidelhorn aerial cable car to the foot of Sidelhorn mountain, an easy hike 1-3.5 hours with panoramic views of Grimsel area, Goms area, Bernese Alps, Rhone & Oberaar glaciers, rivers and 12+ alpine lakes (Lake Grimsel, deep blue Totensee at top of the pass and alpine tarns on southern flanks). Along the descent, see idyllic Triebtenseewli and Bäregg hut from where the panorama opens out onto the UNESCO World Heritage area. Return via Chessituren and the pass road to Grimsel Hospiz or along Oberaar road back to Grimsel pass. Or lift back down. is a scenic base for several hikes, reached by train or road from Brig to the south or Spiez to the north. Oeschinensee is a wonderful alpine lake walled with high cliffs, one of my favorite Swiss sights. To avoid crowds, start early and go midweek. From the top of Gondelbahn Kandersteg – Oeschinensee, walk 15 minutes to reach the lake. Follow the lakeside trail then complete a counterclockwise loop via Ober Bergli back to the lift (5.2 miles with 1395 feet gain) via the higher, more-spectacular ledge trail. Overnight options: On a one-way traverse, we took the higher trail for the best lake views then climbed steeply over Hohtürli Pass (where you could sleep in dorms at Blüemlisalp hut), then down to comfy Griesalp Hotels where we rested in the remote valley of Kiental (1120 meters up and 1380 m down in 13.3 km). Although stairs and ladders helped handle the exposure, the route felt much longer than 8 miles due to steep, exposed rocky & gravelly slopes for a grueling 3700 feet up and 4500 feet down. We rode the Postbus (steepest in Europe) out of Kiental instead of hiking over Sefinenfurke pass to Lauterbrunnen Valley (which saved our weary bodies from climbing another 4000 feet in the same scenery that we had just descended). The next day from Selden, we enjoyed an adventurous traverse across Lötsch glacier and Lötschen Pass (German: Lötschenpass, Swiss German: Lötschepass) to neighboring Lötschental in Valais canton. The walk starts with a reserved Postbus ride from Kandersteg to Selden, climbs 1350 meters, descends 925 m, and ends 13 km later at Lauchernalp lift station, which descends to Wiler in Lötschental, to reach Goppenstein via Postbus, back to Kandersteg via train. You can also reverse the route or stay overnight in dorms at Lötschepass hut. Stay in attractive Blatten. Enjoy a 3-mile walk one way up valley to Kuhmad Chapel (built 1758), past historic wood hayloft buildings and restored wooden chalets. Catch bus at Fafleralp and return to Blatten. Lac Blanc: Hike 4 miles, with 2300 feet vertical gain one way from atop La Flégère cable car, to finish at Index lift (Google maps). Behold the stunning Mont Blanc Massif across the valley. (La Flégère cable car ascends from Les Praz de Chamonix, one train stop from Chamonix or 10 minutes by bus.) End by walking 1 hour to Index lift down. Optionally stay overnight at Refuge du Lac Blanc for sunset and sunrise reflection of the spectacular rock needles rising above Chamonix Valley. Lifts and weather may allow hiking from about June 1 to Nov 1. See hike #12 in “100 Hikes in the Alps.” Or try a less-crowded version that keeps amazing Mont Blanc looming in front of you: start with the earliest bus to Col des Montets, where you walk southwest gaining 3000 feet to Lac Blanc, then finish at Index lift down to La Flégère cable car which descends to Les Praz. (Doing the High Route eastwards, we descended from Lac Blanc 3700 feet in 3.4 miles to Argentiere (or 5.3 miles total from La Flégère). Aiguille du Midi: Don’t miss the Téléphérique de l’Aiguille du Midi cable car from Chamonix (France) to a spectacular shoulder of the Mont Blanc Massif. Take the world’s highest vertical ascent cable car, from 1035 meters to 3842 m (12,605 feet elevation) for an unforgettable, must-do experience. If weather is good on top of Aiguille du Midi, board the Vallee Blanche Aerial Tramway (Funivia dei Ghiacciai, or Télécabine Panoramic Mont-Blanc) to Pointe Helbronner. Optionally take the cable car (Funivie Monte Bianco) from Helbronner Point to Refuge Torino to La Palud near Courmayeur, in the Aosta Valley, Italy. Walk a short distance on snow from Refuge Torino station to Col du Géant for stunning mountain views. In good weather, take the lifts round trip. Or bus from La Palud or Courmayeur through the Mont Blanc Tunnel back to Chamonix. The 112-mile Haute Route (High Route) from Chamonix-Mont-Blanc (France) to Zermatt (Switzerland) offers Old World charm and dramatic scenery from Mont Blanc to the Matterhorn. The whole trek takes two weeks. Day 1 (2-5 hours hiking): Start with Lac Blanc (as above) and stay in the a hut for panoramic views, with sunset and sunrise reflections of the spectacular rock needles rising above Chamonix Valley. Day 2 (5-7 hours): Look for ibex (wild goats) on the way to Col de Balme, the first of 11 high passes on the Haute Route. End the day at Refuge du Peuty. Day 3 (5-7 hours): After a rocky climb to Fênetre d’Arpette, with views of the Glacier du Trient, descend through meadows to the bus at Champex (or keep walking onwards to Zermatt to complete the Haute Route). In 2016, we hiked scenic Lac Louvie (see further below), well worthwhile. In 2005, we continued from Haute Route Day 3 above with public transit from Champex to Arolla, in the municipality of Evolène, in Val d’Hérens. Hiking upwards from Arolla past herding sheds in Alp Pra Gra, we saw the peaks of Les Dents des Veisivi reflected in a tarn. You can optionally stay in dormitories in mountain refuge Cabane des Aiguilles Rouges overlooking Aiguilles de la Tsa and Mont Collon (3637 meters / 11,932 feet) at the head of Val d’Hérens. But we stayed comfortably in a private ensuite double room down in Hotel du Pigne d’Arolla. From Arolla in Val d’Hérens, we crossed Col du Torrent, seeing Dent Blanche (“White Tooth” 14,291 feet / 4356 m) in the Pennine Alps, descending to the turquoise reservoir of Lake Moiry. Fireweed bloomed pink along the trail. Overnight in ritzy Hotel Bella Tolla in the French village of Saint Luc. We walked eastwards from St. Luc, rode up the Tignousa funicular, then walked up 2500 feet to Meidpass, then descended 3400 feet to the German village of Gruben, for a total hike of 9 miles. Meidpass is boundary between French and German cultural areas in Valais/Wallis canton. In Gruben the next day, snow in the passes caused us to take public transit to reach Zermatt instead of hiking, to complete our High Route. Huts/refuges cost $25 to $80 per night per person with meals (2005). Photographs can capture more spectacular sunrise/sunset light up in huts than from hotels down in valleys. Hut info: ohm-chamonix.com and Swiss Alpine Club. Valley hotels: Take lifts, hike high, and sleep low in comfortable hotels or hostels nestled in each valley. We loved a 10-day self-guided “Hiker’s Haute Route” luxury package from Ryder-Walker Alpine Adventures. is one of the great treks of the world, very spectacular and more crowded than the Haute Route. Hike hut to hut, from France to Italy to Switzerland, all on foot in about 8-10 days around the Mont Blanc Massif (or Monte Bianco in Italian). Or day hike the highlights from hotels based in Chamonix, France (above) and Courmayeur, Italy (below). Mont Blanc in French is called Monte Bianco in Italian. Courmayeur, Italy, is a short bus or car ride from Chamonix through the convenient Mont Blanc Tunnel. In clear weather, don’t miss the cable car from La Palud (via Refuge Torino) to Pointe Helbronner, then lift to Aiguille du Midi. Optionally take cable car down to Chamonix. Hike Col du Géant: Near entry to Mont Blanc Tunnel, take La Palud cable car to Refuge Torino (3375 meters elevation). Optionally stay overnight in Refuge Torino (250 beds, reserved 1 week ahead with Italian Alpine Club, CAI) to experience a magical sunset and sunrise. Walk a short distance on snow from Refuge Torino to Col du Géant, a stunning mountain view. See over Vallée Blanche from the Brenva Face of Mont Blanc and over the Aiguilles to Géant. Montagne de la Sax ridge: ~9 miles, ~4000 feet gain one way Courmayeur to Lavachey, sleep there or bus back. Hike high above Val Ferret through larch forest to some of the widest and grandest panoramas of the Mont Blanc Circuit. See back up Val Veni to Col de la Seigne and whole Mont Blanc Massif. Closer rocky peaks form an impressive wall: Géant, Grandes Jorasses, Leschaux, Triolet, and Mont Dolent. Grand Col du Ferret: Drive car 6 miles or bus 10 miles, and hike steeply up ~2700 feet gain. Or hike into Swiss Val Ferret, and bus/train back to Courmayeur via Martigny, or continue hiking around the popular Mont Blanc Circuit. How to get there: The famous mountaineering and ski resort of Zermatt lies at 1620 meters (5310 feet) elevation at the head of Mattertal (Matter Valley) in the Pennine Alps, Valais canton, Switzerland. Most visitors reach Zermatt by cog railway train from the nearby town of Täsch (Zermatt shuttle). Trains also depart for Zermatt from farther down the valley at Visp and Brig on the main Swiss rail network. Small electric taxis serve Zermatt, which bars combustion-engine cars to help preserve small village atmosphere and prevent air pollution. Gornergrat is spectacular cog train terminus located at 10,134 feet / 3130m elevation. The Gornergrat is the first point on a ridge that runs out to Hohtälligrat (3286m) and Stockhorn (3407m amidst a sea of ice) all linked by cable car from Gornergrat. The Gornergrat cog wheel train ride takes 47 minutes from Zermatt station. 25% discount for holders of the Swiss Pass. Take the special dawn train for great a sunrise lighting up the Matterhorn. Leaving Zermatt, the earliest departures are 07:10, 08:00, 08:24… and the last departure is 19:12 as of 2005. Take the cog rail to the Rotenboden stop, then hike east to Gornergrat 1000feet / 300m up in 1 hour, in 2.1 miles / 3.5 kilometers. A short walk on foot will reveal a sunrise reflection of the Matterhorn in Riffelsee and other tarns (ponds). Hike back via Gagihaupt peak (2568m). Hiking one way from Gornergrat down to Zermatt is 7.5 miles, down 5060 feet/1535meters, down in about 4 hours. Overnight option: Riffelberg Hotel (a stop of Gornergrat cog train) sits on spectacular exposed platform above the valley. Dorm beds 75 Swiss Francs per person with half board (dinner & breakfast, 2005); open until mid-October. Höhbalmen offers great views of the Matterhorn from high pastures uncluttered by ski lifts. We hiked this 13.4-mile loop (21.6 km) via Bergrestaurant Edelweiss, Trift Hut, Hohenweg trail, and the interesting Zmutt Valley, with a punishing 4000 feet cumulative gain and loss. I was delighted by the route, except Carol’s feet hurt badly on the final stretch. Stellisee & Fluhalp: the popular Five Lakes Trail (5-Seenweg) starts from Sunnegga Express funicular (a fast 7-minute underground train on east side of Visp River in Zermatt halfway between cemetery and Gornergrat cog rail). Although especially nice for families, the 5 Seenweg (7 miles with 1800 ft gain circling up to Fluhalp) is blemished with ski slope infrastructure throughout (dusty roads, power lines, lifts, snow-making sprinklers, 5 dammed artificial lakes, etc). In compensation are the venerable wood buildings in upper Findeln, the beautiful reflecting lakes of Grindjisee and Stellisee, and majestic views of the Matterhorn. Scenic Stellisee is a 30-minute walk up from Blauherd lift station. Stellisee best reflects the Matterhorn during the glow of sunrise, which you can see after an overnight stay at Bergrestaurant Fluhalp (half board meals, coin showers, private rooms & dormitory; 40 minutes walk up from Blauherd lift, or 1.5 hours hike up from Sunnegga). Views around the Sunnegga-Blauherd-Rothorn lifts may be prettiest when covered in snow during ski season. Gorner Gorge (Gornerschlucht) is a pleasant outing if you have extra time, such as on a rainy day. The peaks of Grand Combin (4314 metres / 14,154 feet on left), Combin de Corbassière (center), and Petit Combin (right) rise above Cabane de Louvie hut on Lake Louvie in the Pennine/Valais Alps, Switzerland. Optionally stay overnight in dorms at Cabane de Louvie. The dramatic Chamois Path (Sentier des Chamois) starts at La Chaux ski lift and ends at Fionnay PostBus. Cross Col Termin (2648m/8688 ft) in Haut Val de Bagnes nature reserve and descend to Lake Louvie via 1800s stone barns to the north, then to Fionnay (640 m up, 1415 m down in 8.5 hours). Click here to see my Portfolio of Engadine images. Ratings: **** four stars = Fantastic. *** three stars = Must do. ** two stars = Worthwhile. * one star = only if time allows. ** Day 1: Stay at in Scuol**, which has very attractive historic buildings and a covered bridge over the Inn/En River, with high mountains for an impressive backdrop. Hotel Guardaval** in Scuol has a great view and very friendly staff. ** Day 2: Walk from Scuol** to Guarda***, via Tarasp** historic castle and Ardez** (great sgraffito). Alternative Route: Hike a longer, remote, higher route which starts from atop Motta Naluns ski lift, hiking via the pleasant & remote Tasna valley* along high pastures and forest to Guarda***. Stay at Hotel Meisser** in beautifully preserved historic Guarda*** (call ahead). * Optional Extra Day: Hike from Cinuos Chel Brail train station to Val Susauna* (a small village with a pretty church in an isolated valley) to Zuoz*, which is bigger but has a pleasant town square. A nice view of Upper Engadine opens out as you approach within a mile of Zuoz and on into the town. ** Day 3: From Muottas Muragl funicular** hike to Segantini Hut down to Pontresina via Alp Languard’s Sessellift (chair lift)**. Optional extension: From Alp Languard, you can also add (or do on its own) a great loop trip along a ridge to Chamanna Paradis** Restaurant, which has a spectacular view of Piz Bernina massif and Morterasch Glacier. Nice moderate grades and great views, but very popular, so don’t expect solitude. Pontresina lodging: Hotel Steinbock** had a tasty buffet included with excellent dinner. **** Day 4: Walk from Morteratsch (second train stop from Pontresina towards Bernina Pass) to Boval Hut. Boval Hut offers close views of Morteratsch Glacier amid an impressive cirque of the icy Bernina Massif. Optionally stay overnight in Boval Hut for a good sunrise light on the spectacular massif. The trail is well graded, not steep, only 5 or 6 miles round trip and 2700 feet gain/loss. Return via lower trail for partial loop. A world favorite day hike! *** Alternative or extra day: continue from Pontresina on the Bernina Express*** train line (the most spectacular train in Switzerland) to the top of the pass, and get off at an interesting area such as Alp Grüm. Optional day hike to Sassal Mason hut. Optionally take the Diavolezza*** lift to stunning views, similar to Boval Hut but 1500-feet higher. *** Alternative or extra day: Spectacular hike from Pontresina up the Roseg Valley to Coaz Hut and over Surlej Pass down to St Moritz. Or hike round trip to Tschierva Hut (a long day, 15.5 miles roundtrip, 2800 ft), also in Roseg Valley. Sils Maria* is a quiet, pretty village on attractive Lake Segl*, reached via Post Bus, more relaxed and cheaper than staying in St Moritz. In Sils Maria, Hotel Edelweiss** is very luxurious, with dinner and good breakfast in a huge ornate ballroom with live piano. Alternative: Explore scraffito in the village of **Samedan, overnight. * Extra Day: Walk from Sils Maria to “pasturesque” Grevasalvas* (setting for the movie Heidi, with some nice old stone buildings), to Lake Lunghin, and optionally up to alpine Piz Lunghin** then descend to Maloja Pass to catch the Post Bus back to Sils Maria. **** Day 5: Ride the Bernina-Diavolezza cable car for spectacular views of the Bernina Range. If not afraid of heights at Diavolezza, don’t miss the short, scenic, rocky hike to Munt Pers*** which gains 265 meters over 2 km one way. *** Day 6: Hike from comfy 1881 SportHotel Pontresina*** up idyllic Roseg Valley** to Fuorcla Surlej**** for stunning views of Piz Bernina and Piz Roseg, finishing at Corvatsch Mittelstation Murtel cable car. Walking 14 km, we went up 1100 meters and down 150 m. Then take the cable car upwards to Corvatsch top station to see the impressive view, before lifting downwards to Murtel and Lake Silvaplana to catch the PostBus. Optionally shorten the day to an easy out-and-back hike of just 4 kilometers via round trip lift from Murtel. *** Day 7: Walk from Cassacia (or Vicosoprano) to Soglio*** village (11 miles, 2000 feet up, 2900 feet down) on the Sentiero Panaramico***, a scenic trail marked with little yellow hiking signs. All three villages are on the Post Bus line. If starting at Cassacia (via Post Bus), the first hiking hour is through pleasant pastures and woods, but within earshot of a busy highway, and follows powerlines, past a dam retaining pretty turquoise water, and within view of another dam (forming lake Lagh da L’Albigna) looming amazingly high on the other side of the valley. After a few hours the Sentiero Panaramico leaves the power lines and progressively gets more aesthetically pleasing, with more and more spectacular views of the Sciora Range*** the closer you get to Soglio***, an attractive town with medieval narrow streets. Lodging in Soglio***: Hotel La Soglina*** has a great view and large, modern, comfortable rooms. Click here to see my Portfolio of Appenzell images. Appenzell offers wonderful trekking for 1-5 days in picture-perfect Swiss scenery, supported by lifts and cozy private double mountain hotels! Appenzell Innerrhoden is Switzerland’s most traditional and smallest-population canton (second smallest by area). The Appenzell Alps rise in northeast Switzerland between Lake Walen and Lake Constance. Our great walking trek (with Alpenwild.com tours) started with a 10-minute bus ride from quaint Appenzell village to Brülisau, where a cable car whisks up to Hoher Kasten (1795 m/5876 ft) mountain in the Alpstein limestone range of the Appenzell Alps. A spectacular ridge walk above the Rhine Valley reaches Berggasthaus Bollenwees, founded in 1903 at scenic Fälensee lake, a wonderful place to stay overnight in private double ensuite (or dormitory rooms). If you choose to ascend Hoher Kasten summit (1794 m) on foot instead of taking the lift, optionally stay overnight midway at Berggasthaus Staubern. Via cable car, Hoher Kasten ridge can also be done as a long day hike. The next day, admire sunrise on Fälensee lake. Cross Bötzel pass (in sight of Santis peak, our goal for day 3). Descend to Berggasthaus Meglisalp, which can only be reached on foot in the spectacular heart of the Alpstein range. This authentic mountain hostelry, owned by the same family for five generations, dates from 1897. Meglisalp is a working dairy farm, restaurant and guest house surrounded by majestic peaks (Altmann peak 2435m) rising above green pastures. From Meglisalp, a long ascent reaches Berggasthaus Rotsteinpass (2120 m) for lunch at a remote restaurant. Everyone was excited to see a large family of ibex crossing rocky & snowy slopes above. Weaving through limestone outcroppings, we ascended the stunning Lisengrat, a sinuous chain-protected trail to the summit of Säntis, one of the most exciting trails in the Alps. The rocky route is safely assisted by chains, but can be scary for those with fear of heights. Shared by three cantons, Säntis can be reached easily via cable car or with effort via trails, to see vast mountain views across six countries: Switzerland, Germany, Austria, Liechtenstein, France and Italy. Säntis makes a great day trip, dining experience, or overnighter including fun walking the Lisengrat. When starting at Säntis (2502 m / 8218 feet elevation), the full Lisengrat ridge route goes down to Rotsteinpass then up to Altmann (2435 m / 7989 ft), connecting the two highest peaks in the Alpstein. Search for latest “Alps travel books” on Amazon.com (look for updates every 1 to 3 years). Lonely Planet Switzerland is a great country guide for planning a tour and carrying along. Rick Steves’ Switzerland defines concise and efficient tour itineraries for those with limited time. Rick Steves updates the books every year for each country in Europe, saving time and money on heartfelt experiences. Switzerland (Eyewitness Travel Guides) is a glossy dream guide which excites your pre-trip planning and makes a handsome souvenir. Alps hiking books by Cicerone Guides are essential for planning a hiking trip and carrying along.